Geographic Information Systems and other mapping tools will help you locate, present, analyze, and interact with data that is geographically referenced. These tools are used in many fields such as environmental studies, geography, geology, natural resources management, demographics, public health, economics, history, and much, much more. 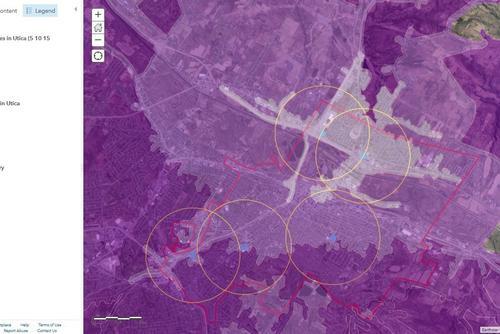 What does it mean to work with spatially-referenced data? What would your students gain from working with GIS and mapping tools? Find out something about spatial thinking and analysis or about data visualization. See what GIS and map enthusiasts are writing about in these GIS and mapping blogs. Looking for maps to use in your classes? Browse through some of the great online map collections to see what's available. Supplement your class with one of these map-related teaching resources. How would you incorporate maps and mapping tools into your classes? Take a look at these suggestions for using GIS and maps in class. See examples of simple student and class mapping projects at other colleges. You can also look through Complex Projects in the Liberal Arts for examples of more time-intensive projects. Scroll through this amazing list of GIS projects in the Digital Humanities. Want your students to have the experience of creating their own maps? Try out some of these robust online mapping tools to see more of what can be done with maps and mapping. How would you find geographically-referenced data? Learn how to search for spatial data using an Internet Mapping Service. These are online sites provided by national, international, federal, state and local government agencies to allow access to public data. Some NGOs and institutional sites also provide excellent resources. Most sites include a tutorial or "Getting Started" page that will show you most of the site's features in a very short period of time. For a few examples, check out a page of New York City Mapping Resources or Disaster Response Resources. Do you have data of your own that you'd like to map? If you have a list of locations and would like to create points with pop-ups, then one easy option is to use Google Maps or Google Earth. Here's a page of Google resources, including links to helpful web services and very informative blogs and tutorials. In order to use your Hamilton Gmail account for Google Maps, please see Accessing Google Maps at Hamilton. For more complex mapping efforts which are still within Google, you can try Spreadsheet Mapper or Fusion Tables. Do you need a more customized map, basic spatial analysis, or a web app? We have ArcGIS Online from ESRI. This web-based GIS is accessible via Mac or Windows, includes various base maps, data layers, spatial analysis tools, publishing templates, and produces maps that look great on mobile devices. Plus, it's easy to learn how to do the basics! Check out the Gallery of what you can do with this application, and call 315-859-4735 if you are interested in using this in a class. Read more about what we have available to us under our ESRI Site License. Do you need to manipulate data or perform more extensive spatial analysis? You are probably looking for a Geographic Information System. We have some applications available on campus (such as ArcGIS), but others are open-source or reasonably low-cost. All of these applications allow the importation or creation of geospatial data, the analysis of this data using various techniques (such as buffering or hillshade), and the layout of professional-quality maps. Learning how to use these applications will require many hours of instruction, however, so make sure that you really need these tools. For further information about GIS or using mapping resources in class, please contact course-support@hamilton.edu, or call 315-859-4735.